Advantage Multi for dogs prevents parasite infections, fleas, heartworm, gastrointestinal worms, mites and lice. It is conveniently applicable as a topical cream. As long as you appropriately administer a once a month dose, you’ll keep your dog pest free for the better part of a year with just one purchase. So order your supplies today. How can you check quality control if it's from Singapore? Dogs lives are at stake. I was getting Stronghold & it worked well for heartworm but not other parasites like hookworm. Did it also come from Singapore? This product is the UK (EU) version and most likely it will come from our UK warehouse. We don't actually buy any products from Singapore (or any other Asian country), we only process orders from our warehouse. How come advantage multi (advocate) don,t protect against ticks ? 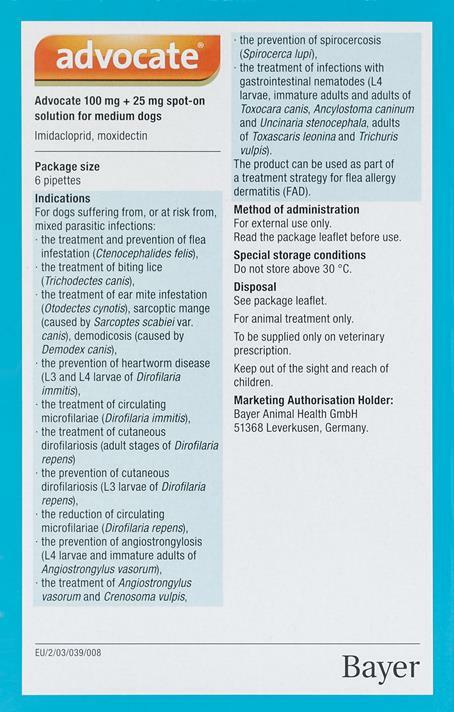 Advantage Multi treats and protects against fleas, heartworms and other intestinal worms. It doesn't cover ticks. Free worldwide shipping for orders over $20.00. Orders generally take 10 to 15 business days to be delivered. How long will this take to get in FLA, USA and is there any discounts available? It can take 10-15 days typically. Sorry but at this time we cannot further discount as we are extremely cheap to start with. Have always used this product for my dogs & wouldn't use anything else. Vet. always checks with me to see that is what I use. Great product. Great product and great price!! !